The big game is approaching! There is no use in sitting alone in your house watching the Buckeyes play! Join fellow San Antonio Buckeyes every game! 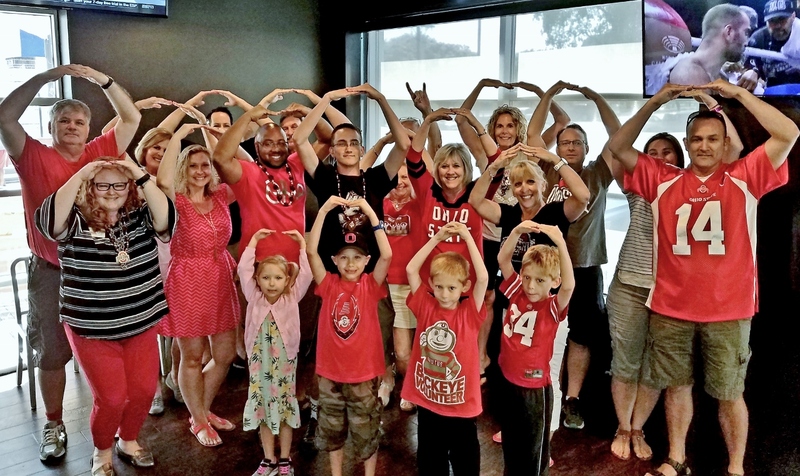 The Ohio State Alumni Club of San Antonio has a game watch at Walk-Ons at 11075 W. I-10 (near Huebner Rd) and the atmosphere, cheering and TBDBITL is the next best thing to being at the game! We have weekly door prizes to raise funds for scholarships. For the Purdue game, we had a special children’s Halloween costume contest at halftime. This year we will have several special events around the TTUN game watch, including a silent auction of Buckeye memorabilia! We now accept credit cards for purchases. Our club is much, much more than a football watching group. We also partner with fellow Big Ten alumni groups for picnics and other events! To join The Ohio State Alumni Club of San Antonio, come to a game watch, visit our membership page or email either Danielsj53@hotmail.com or Kaylamgossett@yahoo.com. We hope you will join us and find “how firm our friendship” is GO BUCKS!! !